Must be able to determine conditions of metal surfaces; Know composition and classification of paints; Capable of working reliably; Thoroughly and independently; Can work overtime on holidays and weekends; With previous experience in shipyard is a plus; Willing to be assigned to various project sites outside Zambales. Female; College level or College graduate; With knowledge in MS Office particularly Word and Excel; Willing to work overtime and holidays and weekends. Male; With professional Driver’s License; Must know the route to travel Manila, Clark and SBMA area; With good personality and conduct. Female; Preferably with work experience as F & B Dining Attendant; With good personality. Male; With 1 year work experience as Assistant Cook; With good personality and willing to be trained. Male / Female; With 1 year work experience as Front Office Attendant; With good personality. Female; College graduate of 4 year course (preferably I.T. course); Non-smoker. Female; Candidate must possess at least a Bachelor’s / College Degree in Accountancy; Can handle benefits (SSS, Pag-ibig and Philhealth); Can process government payment and compliance; Non-smoker. Male; At least High school graduate / College level; Must be a non-smoker. Male; At least High school graduate or College level; With 3 to 5 years experience; With valid driver’s license, with restriction code nos. 1, 2, 3, 8 and with good driving record; Must be flexible, dependable, time-conscious and able to move from project to project with minimal supervision; Must be a non-smoker. Male; High school graduate / College level; With at least 2 years experience in the same position; Non-smoker. Candidate must possess at least a Diploma, Advanced / Higher / Graduate Diploma, any field; Candidate must be able to speak and write in Mandarin and English; No work experience required; Fresh graduates are welcome to apply; Responsible, dedicated and able to work in fast paced environment; Meticulous and sensitive to numbers and staff needs; Good communication and negotiation skills; Independent and able to adapt to different culture. 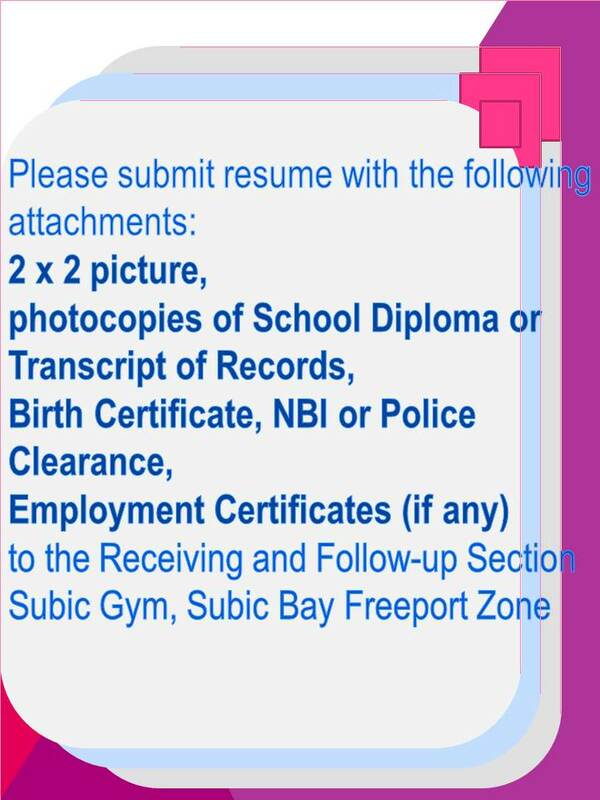 Male; At least College level or Vocational graduate; Must possess a valid Driver’s License; With at least relevant experience in the field; Must be familiar with any point in Luzon area; Willing to render overtime; With good moral character.